I never did finish off my little series on V:tM - Bloodlines. Oh, well, no time like the present. Let's talk werewolves. 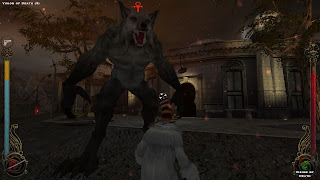 Both V:tM cRPG adaptations feature exactly one (1) werewolf encounter. This is blatant tokenism and my were-lawyer shall hear of it. Redemption's version was somewhat criticized for it non-sequitur simplicity. As you exit a quest location, a werewolf bursts out of a wooden crate and jumps you. Completely unrelated to anything else going on in the game. WTF? The fight itself wasn't much better; standard tank'n'spank with lots of health potion abuse. Bloodlines was a far superior game. Its werewolf fight, however, was even worse. Let me lament, once again, the portrayal of werewolves as over-beefed and under-characterized. Why did it have to be a kaiju? 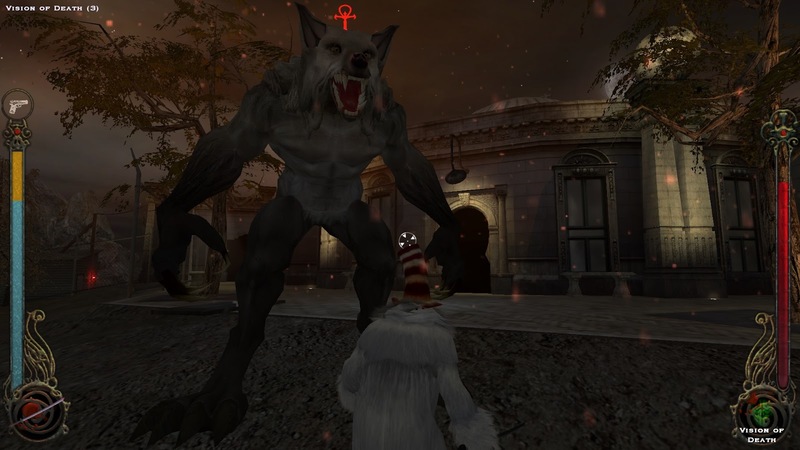 But more to the point, Bloodlines' werewolf fight is not a fight. You cannot harm the beast and it can take you out in 3-4 swipes, so you spend four minutes running in circles around Griffith Park Observatory trying to glitch the AI's pathing at doorways and corners to buy yourself time. So how does it fail? 1) You're running in circles. Good chase scenes are linear (think Half-Life 2's opening sequence or utterly gratuitous (yet cool!) hoverboat gauntlet) or maybe sometimes they can be spirals, letting you watch your own progress. This rodeo on the other hand gets old after a couple of laps. And then you realize it's only been thirty seconds. Three more minutes to go. 2) No interaction. Chase scenes have a lot in common with stealth-based games in emphasizing traps, obstacles and other indirect interaction. If you can't kill the boogeyman, can you trip him? Blind him? Lock him in the fridge? Bloodlines' observatory romp lacks any interactable objects beyond opening and closing doors. No barrels to blow up, no chairs to knock over. There is a way to actually kill the werewolf by pressing a couple of switches, or so a walkthrough informs. I swear to all that's toothy that in three? four? more? campaigns I've never bothered with it. The trap itself shows no signs that it might be activated and its switches give no feedback that you're actually progressing toward a solution. 3) For all its frustration, evading the werewolf by running in circles is actually quite easy, giving you no incentive to look for another solution, managing to both demand constant attention yet provide no real challenge, nerve-wracking and dull at the same time. All you have to do is keep chasing your tail for four minutes straight and you're done. It reeks of the sort of penultimate chapter game-changer which developers like to throw in to wreck their own pacing and coherence.